I needed a gift for some friends, so I made this box last weekend. It’s hackberry with a curly cherry top, poplar bottom and walnut splines. I put a groove near the top of the box with a scratch stock, and a couple grooves near the bottom with a Lie-Nielsen #61 beading tool. Also rounded over the edge of the top with the beading tool. Finish is three coats of platina shellac, plus two coats of Behlens violin varnish on the outside, and two coats of orange shellac on the inside. The hackberry board was resawn so the left side and the front are continuous grain, and then the book matched grain continues on the right and back. When I give it to my friends, it’ll have a half dozen chocolate chip cookies that my sweetie made inside it to sweeten the deal. Nice box, great mix of contrasting woods. THAT deal does not NEED sweetener! The box is sweet enough! Great looking Box. I like the style of the corner splines, Great job. Dave, nice work. I like the faux dovetail corner splines. Making those by hand took some skill. The wood and finish are beautiful. Visually, I would like the hinges better if they were mitered into the back edges, but your system works well mechanically. This is a wonderful, useful gift for your friend. Thanks for sharing. Dave, your hand tool skills are impressive to say the least…how did you manage those splines? The splines are actually pretty easy to do with hand tools. I just clamp the box at a 45 in my vise, then cut “dovetails” in the corner, removing the waste with a coping saw (I cut them freehand, but they’re more or less 1:4 tails because that’s what I cut). The spline is formed by riving a piece of walnut to approximately the right size, then I use a chisel to pare off little bits of wood until it fits nicely. In this case, I had the splines pretty short, because I was nearing the end of my scrap of walnut, but normally they’re 2-3” long, and easy to hold in a vise or something while I’m paring them to fit. 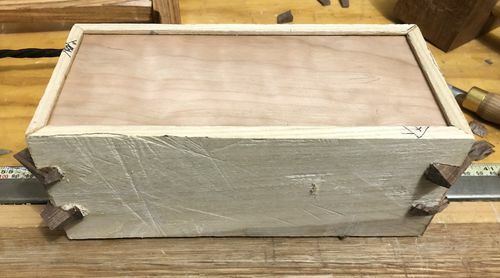 Once the glue has dried overnight, I cut them flush with a dozuki, then plane the side of the box flat and do any finish work with the box whole. Al, I plan to do a better job on the hinges in the future. In this case I was under some time pressure and decided that screwing the hinge onto the outside of the box without mortising it in was the safest and quickest way to a solution. I know I can get a good mechanical fit this way without too much trouble. I just put a business card in between the front of the lid and the box so there’s a tiny gap while I’m putting on the hinge, and then the box will close completely. The best part is that you made hackberry look good. You do good work! It will make a great gift for someone Dave. You have gone a long way with hand tools and the quality shows. 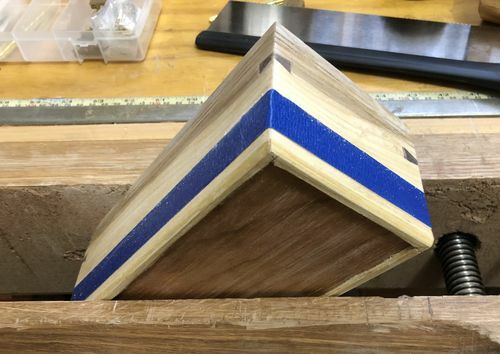 Dave – another good looking project you made with nothing but hand tools. You mentioned hinges. Lately it seems like there have been a number of project using a simple brass pin on each side as the hinge. You should give that approach a try some time. Thanks, folks. I’m happy enough with the brass hinges and know they hold up pretty well. I just wish I’d had time to mortise them into the wood. I may look at wooden hinges at some point, but I’ve seen seasonal problems with those. Oh well. There’ll be another box. Or two. They got the box this evening and it was a hit, so mission accomplished. Nice box Dave, and the Cookies just put it into orbit, Way over the top. Nice job, gonna have to share the “3” with your sweetie though.